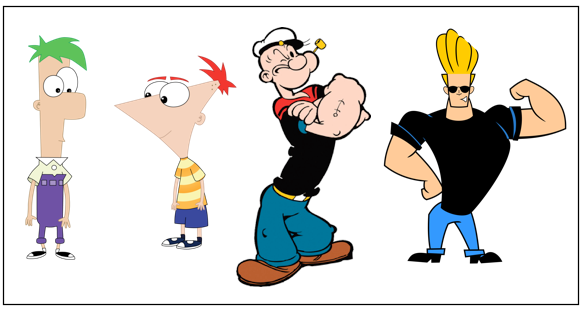 From left to right, popular cartoon characters Ferb, Phineas, Popeye, and Johnny Bravo. Do you ever scratch your head and roll your eyes at the ridiculous shapes of cartoon characters? While it can’t be confirmed that Phineas and Ferb have legitimate jaw bones, there may be a scientific explanation to Popeye’s rounded jaw to Johnny Bravo’s square jaw. A recent study published online in Scientific Reports on April 16, 2018, validated a significant association between mandibular shape and jaw muscle cross-sectional size. In other words, researchers found that thicker jaw muscles produced broader, bigger, and more rectangular jaw bones. Previous studies have shown that craniofacial skeletal form, or the structure of the bones of the face and jaw, is influenced by mechanical loading. Just as your leg bones get stronger from running, and arm bones get stronger from lifting weights, jaw bones get stronger from chewing. The specific shape of the mandibular bone is also determined by the forces applied to it throughout development. So, you might get your dad’s square jaw through genetics, but you also have a square jaw because of the foods you eat regularly. 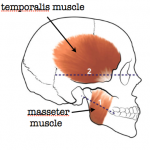 The temporalis muscle and master muscle of the skull. 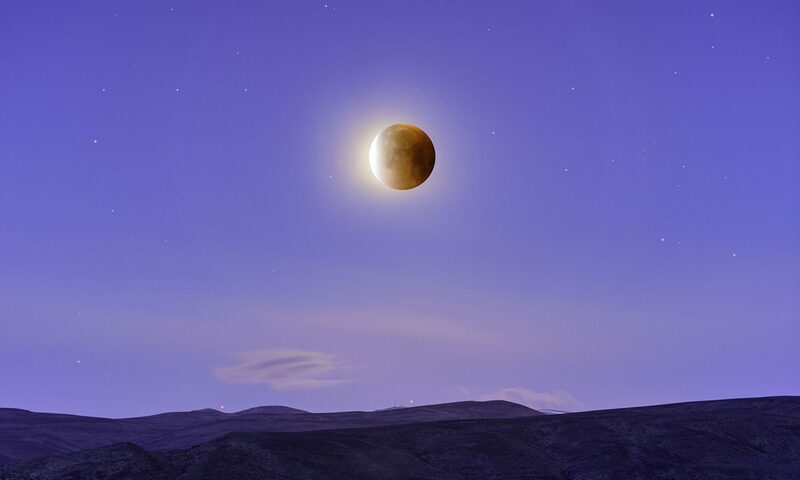 Credit: Sella-Tunis et al. Labels added. Scientists at Carmel Research Center in Israel measured jaw shapes and jaw muscles in 382 adult patients by utilizing CT scans. These scans allow for visualization of both bone and muscle, and they specifically looked at (1) the temporalis muscle, which is a large, round muscle that reaches from the side of the skull to the side of the face, and (2) the masseter muscle, which stretches from the lower jaw to the upper jaw. Comparison of jaw bone size and shape. Credit: Sella-Tunis et al. Labels added. 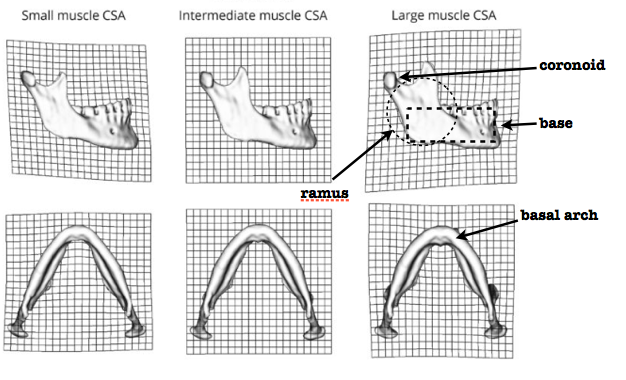 Independent of gender and accounting for relative size of individuals, researchers found that larger jaw muscles resulted in a wider ramus, a bigger coronoid projection, a more rectangular base, and a more rounded basal arch. Alternatively, smaller muscles produced a skinnier ramus, a smaller coronoid projection, a narrower and angled base, and a more triangular basal arch (see picture above). This research can be used in anthropology contexts. Researchers suspect that hunter-gatherer populations had harder diets, comprised of nuts and meat, which generate larger muscles and produced a stronger jaw line, while agricultural groups that ate more vegetation had skulls that resembled the jaws with smaller muscles. According to this data, it is plausible that Popeye’s spinach diet led to the growth of his softer, rounder jaw, and I would guess that Johnny Bravo is a fan of tougher foods. Sella-Tunis, T., Pokhojaev, A., Sarig, R., O’Higgins, P., & May, H. 2018. Human mandibular shape is associated with masticatory muscle force. Scientific Reports 8. [doi: 10.1038/s41598-018-24293-3].